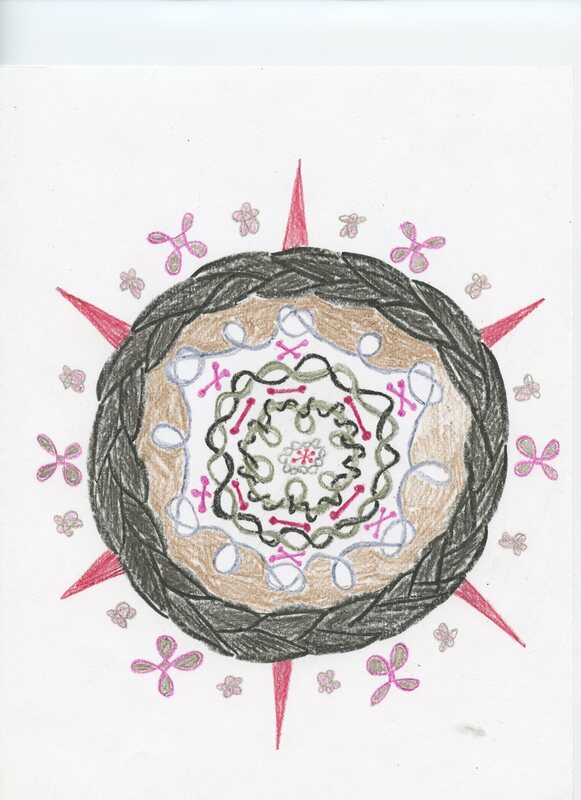 Without notes, it’s hard to remember some of the details, but I have a pretty good idea that this mandala is about ill-advised relationships, about feeling tied (or in this case, sewn to) to a person who is emotionally dangerous to you. Sometimes things can feel good or right in the moment, but all the while they’re slicing you up and leaving scars. Sometimes, those are the hardest relationships to get away from. Speaking of things that slice you up and leave scars, the detail I was too tired to write about yesterday concerned thorns. In my hands. As many readers know, I live in the desert, where much of the local flora is extremely pointy. Even the trees can be insanely dangerous. Before we bought our house, The Man and I lived on a property where the mesquite trees had 4-inch thorns. I’m not even exaggerating. Every person who ever lived there had, at least once, the experience of going outside wearing shoes and accidentally stepping on a thorn so long that it penetrated the sole and pierced deep into their foot. We have a mesquite tree here, but it’s not quite as dangerous, and it’s at the very back of the property, where its calculated unruliness helps stem the flow of traffic from the utility easement into our yard. We also have a palo verde tree that is very close to the house. Probably, it should be removed, but I’m sort of fond it it, even though it’s considered a weed tree. They grow so fast that this one has begun to take over our roof. Palo verdes are also thorny, and while the thorns are much smaller, to my mind, the small ones are much more insidious. This did not deter me; once up there, I could see that the tree was compromising the roof. There was a 3-inch mat of the needle-like leaves, which were trapping water and causing the insulating foam to decay. It took me 4 hours, spread out over 2 days, to clear them off and cut back as much of this tree as I could reach, and I was so intent on the job that I didn’t even notice my hand filling up with little tiny thorns. My right (dominant) hand took the brunt of it, with the first knuckle of my index finger being severely compromised with three piercings. I could barely straighten it for 2 days, and the first knuckle of the left index finger also had one thorn stuck in it, which made simple tasks like putting on pants pretty painful. The Man dug around in my flesh with a needle to the best of his ability, but the thorns were too small, too deep. They’ll just have to work themselves out on their own. So that’s what I was contending with last night. The pain is greatly receded today. A few years back, The Man and I were trimming a date palm out front. Most people don’t realize that palm fronds can be incredibly sharp. Both of us took a pointy piece of frond deep into the hand, so far in that there was no extracting those pernicious little slivers. Six weeks later, within 24 hours of each other, we both were surprised to find our bodies expelling tiny, woody spear tips that we had forgotten were inside of us. So I expect that sometime around the end of March, I will be reminded of this experience on a strange day when my hands eject a dozen tiny minuscule palo verde thorns. This entry was posted in mandalas and tagged cactus, injury, mandala, mesquite, palo verde, pierce, piercing, red, relationship, thorns, tied on February 12, 2015 by littledragonblue.